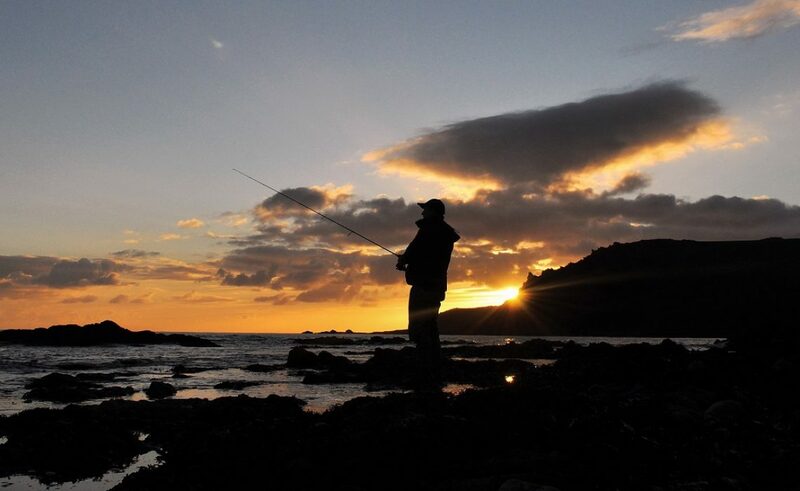 This is the story of my most recent 3 Day Package (3 Clients/3 Days Guided Bass Fishing including 3 Nights accommodation for £499pp) that was competed between the 16-18 September. My clients for the next three days were Andy B, Andy M and Nick. All three of them were experienced anglers in their own right in disciplines such as Game, Fly and general Sea Fishing respectively. With the gear loaded up we headed for a stretch of coastline that was exposed to the light westerly wind. If there was likely to be any movement to the sea, in addition to a little bit of ‘white water’ this is the location that would feel its effects, and that, in turn, would also encourage the bass to feed. Peering over the cliffs, to me, it looked absolutely ‘spot on’ with 1.5m of swell gently swilling around the outer edges of the rocks and being funnelled spectacularly into the various coves and inlets present here. Andy B casting out his HTO Canine surface lure just after landing a small bass. As before, I instructed my clients to use differing lure types. Andy M was utilising a ‘modern classic’ and a lure that was exceptionally stable in the swell washing up onto the nearby shingle beach that I placed him on – the Megabass Zonk Gataride here. Andy B was using one of my ‘lures of the season’ (the HTO Canine here) in one section of what I would describe as an inlet (effectively a gully with a dead-end under a cliff) whereas Nick was using a shallow diving and very long casting minnow in the form of a Daiwa Shoreline Shiner Z120F SSR here and working it within the opposite side of the inlet. I felt I had all the angles covered and waited intently whilst perched so that I could skip across the rocks or beach in an instant, in order to assist them and net any fish caught. Three casts in, and as I was stood with Andy B talking him through how to ‘perfect’ the ‘walk the dog’ retrieve with the large surface lure, we both witnessed a small bass rise at breakneck speed from the seabed and smash the ‘Canine’ that was turning and splashing above it. It was no match for the lure rod/reel and was quickly wriggling around in my net – a good start! As often happens though, when you catch one ‘early doors’ you don’t get a sniff for the rest of the session which, considering the sea conditions, was somewhat surprising. Yet again, a bass that is hooked on the centre-mounted Size 2 treble hook (note the black or bronze coloured hooks I use rather than shimmering silver ones). Twenty minutes into the session and a shout from Nick (who was using a white Jim’s Lures Needlefish) signalled that he was into a fish – fantastic! Sprinting across the soft shingle, the sight of the rod tip nodding and a little line being pulled off the spool had us both excited. As ever, my headtorch was deployed and almost immediately a decent sized ‘silver bar’ could be seen steaming through the undertow – it wasn’t a schoolie! A few seconds passed, before I managed to safely grab the leader and steer the near 4lb bass onto the shingle – another good start! A very pleasing bass that Nick latched into within 20 minutes of the session commencing – pity it went quiet thereafter. Sadly for the two Andy’s, this was the only bite and the only fish of the session, but they were both extremely pleased to have witnessed a bass in the dark on one of these very ‘plain’ looking, but very effective lures – plus, there was always tomorrow and the next day. No, I wasn’t in the water when I took this photograph – but the camera nearly was! Nick was fishing with the same Daiwa Shoreline Shiner lure and targeting an area parallel to a ‘bus-sized’ rock while the two Andy’s were positioned so that they could work surface lures around the outer edge and seaward side of the pinnacles of rock that adorn this stretch of coastline. Separate to these scattered formations is a pure sandy seabed, however, I believe the reason this mark produces lots of bass is due to the huge ‘eddy’ that is created by a nearby headland, alongside the cover provided by the rocks – whereby bass can simply hold and pounce on anything ‘smaller’ and that is either washed by or swims past. Andy M was the first to register this time round with a small (1½lb) bass that nailed his Patchinko 125 surface lure here – but this was a special one as it was the first bass he’d ever caught. Later in the session though, he was provided with a real ‘treat’ as following a cast over a submerged rock (and with a little bit of fine tuning to his ‘walk the dog’ technique) we both watched as a larger bass shot up and smashed the lure from beneath – yes! This was the one we wanted! In between these successes Andy B had landed a small bass himself, but considering he’d only fished with the same surface lure in daylight up until this point I was keen to change him onto a sub-surface medium diver – especially considering the amount of aerated water in conjunction with the now increased swell – it looked very inviting… I passed him one of my ‘treasured’ Daiwa Shoreline Shiner’s in the Z120F Vertice here pattern (note the lack of SSR or Super Shallow Runner on this one) as I wanted something that would cast well into the stiffening headwind and ‘grip’ into the swell. I instructed him to keep casting into a zone that was effectively an entrance to the gully he’d be retrieving the lure through and just beyond a submerged rock jutting out into the tide. I envisaged the bass moving from our left (with the now ebbing tide) which meant that any swimming around the outer edge of the rock would receive a quick glimpse of the lure only – perfect, as they are noticeably more positive in this scenario. In the back of my mind also, was a recent session when a client was ‘snapped off’ by a much larger bass that he’d hooked on a sub-surface lure following a number of small ones he’d taken ‘off the top’ from this very spot. Patiently, Andy kept at it as briefed, and it was as I unhooking Andy M’s larger bass that I heard him screech behind me. Wow! The rod was bent right over and thumping hard as what I hoped was a really big one attempted to swim back against the tide and around ‘that rock’. Andy did a brilliant job of controlling this powerful run (understandable considering he’d landed some huge ‘Game’ fish in his time) before pre-empting the fish swimming towards him and trying to throw the hooks by taking in the line quickly. As the bass was gradually brought towards our stance it remained under the surface – something that had me thinking it was either foul-hooked or very large… Therefore, I was somewhat disappointed to actually see it break the surface a couple of metres beyond my waiting net. A three pound bass that fought like a six pounder! Incidentally it wasn’t foul-hooked but rather very lightly hooked in the lip and on one point of the treble. Not for the first time (actually, about the bloody umpteenth time!) the ‘forecast’ southerly gale that was due to commence at around 2000 didn’t materialise until close to midnight. What this meant was that I cancelled the planned night session and following a very nice pub lunch that we all enjoyed I decided we should fish during the afternoon instead. However, with the Sun now beating down on us and the wind having dropped out entirely (neither of which was forecast) meant that the afternoon session went by without a bite or a bass… I wasn’t happy and felt I’d let my clients down to be honest. The third day dawned bright and sunny but the wind (that had arrived overnight) was still strong and from a south-westerly direction. Therefore, my plan was for them to hit a nearby sandy estuary mark with the wind at their backs. 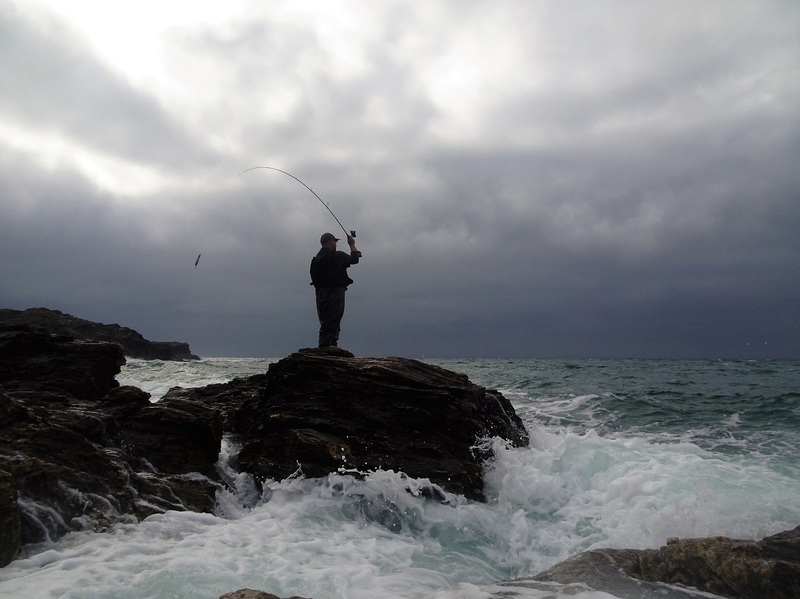 The open coast was well and truly off limits as the sea was unbelievably wild, but due to the topography of the south Devon coastline there is nearly always (95% of the time) somewhere that I can take clients with a great chance of connecting with a few bass even in the worst conditions. My three clients enjoying the Sun, I mean the bass fishing… Just look at that sea behind them – hence the requirement to fish a very sheltered and calm estuary mark. With the water clarity OK, yet with significant amounts of weed moving through, a variety of lures were brought into action including jigs (spinners) here, small surface lures here and the Savage Gear Line Thru Sandeels here. Despite fishing their hearts out, neither of my clients registered a bass. To me, it looked like ‘big bass conditions’ but it just wasn’t to be. Back to the drawing board it was for the final onslaught in darkness. Clearly, with being a guide comes quite a lot of pressure – which is why I have a number of what I would call ‘banker’ marks up my sleeve. Now admittedly, the bass that my clients might encounter from these venues might not be the largest (although you never know, of course!). But sometimes, just enabling a client to catch a bass by utilising a new method, a new lure, in darkness or from a type of venue that they’d never previously considered before is more important than attempting to guide them to that ‘monster’. With the above in mind, I chose a comfortable spot that would provide a modicum of shelter from the elements (a strong wind and the threat of heavy showers) whilst enabling them a very good chance of a bass in the gloom despite the coloured and weed fragment infested sea that met us upon our arrival. As Nick wasn’t able to attend this final session it was just the two Andy’s to guide. Therefore, I placed Andy M on a quicker sinking cream or ‘bone’ coloured Super Strike N Fish (Needlefish) here while Andy B concentrated his efforts on using a medium diving hard minnow (a white Savage Gear Manic Prey here) that would again, grip or dig into the waves pushing up the beach. I’ve got to hand it to them both, they kept ‘at it’ in some very frustrating circumstances as on nearly every single retrieve the lure was being cloaked in weed fragments in the final couple of metres as the lure approached the beach. Of course, I could have looked to move somewhere else, but considering the lures were still doing what they were designed to do and moving and swimming freely for 60-70% of the retrieve I decided we should remain where we were. On two occasions Andy M commented that he’d felt a very distinct ‘tap’ on the lure and when he’d finished the retrieve it was still ‘clean’ so to speak. There were clearly fish out on the shingle bank and flat rock that the lures were being worked over, so they just needed to persevere while I kept my fingers crossed behind my back! Another type of needlefish that is proving its worth – the Super Strike N Fish in the ‘Bone’ colour. This bass certainly managed to ‘home in’ on it despite the cloudy, silted up water and in darkness. BANG! I was stood with Andy M as his very powerful Apia lure rod here was pulled over as a good bass grabbed the needlefish 20m out from the beach. In the drizzly air, his shockingly coloured orange braid was pulled left, then right, as the bass utilised the undertow of the breaking waves to cruise around in front of us. It had taken a huge amount of patience to hook this bass and I could tell that Andy M (a very experience Fly and Trout angler) wasn’t about to panic or rush getting this one in as the waves receding off of the beach threatened to exert too much pressure on the hook hold. Between us, we managed to guide it on the shingle during a brief lull in the swell, whereby I grabbed the leader and slid it as quickly as I could to safety. I think Andy M was slightly stunned to be holding this lovely bass in this photograph! Watching him hook and land this bass is one of the highlights of the season for me, as it was so thoroughly deserved for all the effort that went into catching it (on his part). After returning this very welcome bass to its rightful home I turned around to find its captor packing is rod, reel and lures away for the evening – “That’s as good as it gets as far as I’m concerned Marc, I’d die a happy Man here tonight too”, he said! Brilliant! All in all, despite the weather doing its utmost to spoil things all three clients landed bass in the 3-4lb range. Additionally, they were all caught on differing lure types and from differing venues which is always very pleasing. Add in the mackerel, garfish and solitary pollack and we all agreed it had been a testing but a very satisfying few days. If you are interested in purchasing my book (that was released on the 8th October) titled ‘The Lure of The Bass’ please see my recent blog post here for details on how to reserve your copy.